Assault Events worked with Tinderbox Theatre Company during ‘Total Theatre’–two weeks in which three different companies (Tinderbox, Theatre Abandon, Assault Events; supported by ACNI funding) worked with a troupe of 10 incredibly skilled performers on three completely different pieces. The performers had a range of comfort zones, some were mainly actors, some dancers, some musicians, but by the end of the two weeks, you wouldn’t be able to discern their original specialties because of how they had grown as individuals and together as an ensemble. This development week gave an opportunity for Assault Events and me to develop, by chance, one of the ‘Dirty Evangelica’ characters that had been just on the periphery of Sandie’s mind so far, and who I hadn’t written anything for–Trainer Boy. 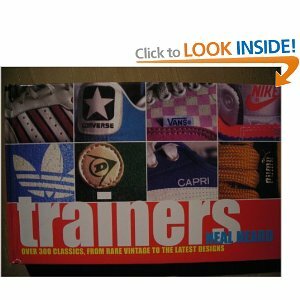 Sandie had brought a gorgeous book about all different kinds of trainers to the studio. It made me think about the prevalence of high heeled shoes on drag queens in NYC clubs, and trainers/sneakers in street culture. It’s about persona, status, territory, turf. I saw a volatility in the relationship Patrick and Stevie had created. Then I went away and wrote a few lines of dialogue–short, condensed lines to go with the precise (and busy) movement. Here is a montage of clips from Dirty Evangelica’s development week during Total Theatre, where you can spot Stevie and Patrick as the Trainer Boyz, as well as other Dirty Evangelica characters. Missing NYC… but dance company Assault Events‘ new project is gonna change all that: a hopscotch highway, D&G toy boys, big beat sublime laws, techno electro nip hop and strip hop, gatecrasher glamour grit in Dirty Evangelica’s domain.